Here we have some pictures from Doll Diaries of Julie, they really get behind the scenes. Julie’s looks aren’t what we thought they would be. She has much longer hair and, to me, looks much prettier. I wasn’t expecting her to be sporty, but it’s great that she has some sport in her genes. In this picture, Julie has 2 very cute dogs at her side! Don’t you agree? This is a picture of Julie’s friend, Ivy. Ivy has the same face mold as Jess. Don’t you see the resemblance? I think this Julie is much prettier (And cooler) than the other one. Don’t you think? August 21, 2007. 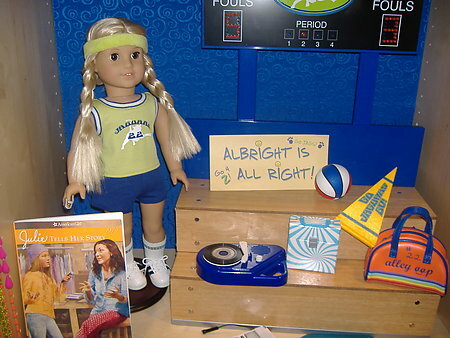 New American girl dolls and items.